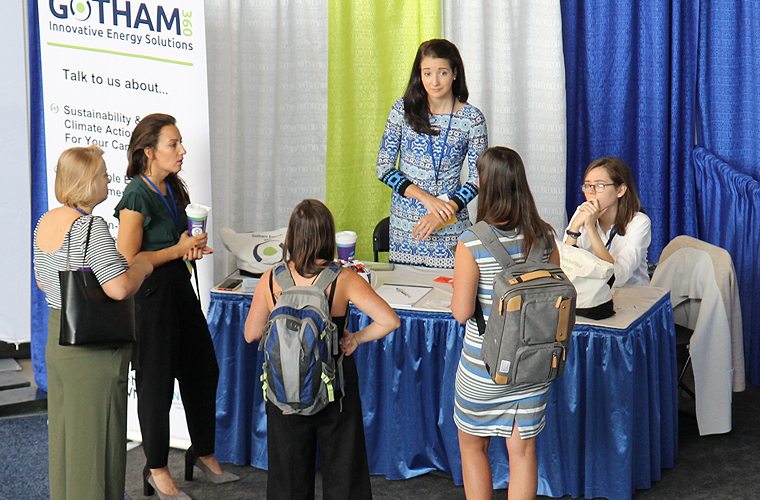 Gotham 360 was very pleased to participate as a Bronze Level sponsor at the 2018 AASHE conference in Pittsburgh, PA. Our team joined sustainability leaders from across North America to exchange ideas, impacting transformative actions that are within sustainability, higher education and surrounding communities. The theme of this year's conference was "Global Goals: Rising to the Challenge" and it kicked-off with a keynote from Dr. Akpezi Ogbuigwe, the former Head of Environmental Education and Training at the United Nations Environment Program. Dr. Ogbuigwe set a strong tone for all attendees, as she spoke with passion about her three decades of work in the Perpetual Sustainability movement. Her incredible stage presence amplified her message about the role the UN's Sustainability Development Goals (SDGs) play within higher education. Rethinking teaching, research and community engagement are critical roles of higher education in achieving ambitious global targets to end poverty, protect the planet and ensure prosperity for all by 2030. Dr. Ogbuigwe stressed that the need for sustainability leadership in higher education is greater now than ever, with an ever-shrinking window for action. To that end, it was heartening to be surrounded by so many enthusiastic participants at the AASHE Conference. Working for a WBE Certified Women Owned Business, it was especially gratifying for me and my team to share the expo floor and sessions with the large contingent of women who were present. In her address, Dr. Ogbuigwe emphasized that women are helping lead the way towards a more sustainable future globally. According to the UN Food and Agriculture Organization, women produce 50 percent of agricultural output in Asia - and represent nearly 80 percent of the agricultural labor force in parts of Africa. The same study argued that if women had the same access as men to agricultural resources, production would increase by 20-30 percent, and has the potential to reduce the number of hungry people in the world by 12-17 percent. Apparently, girl power really can save the planet! As a Canadian citizen, I was also very happy to see higher education institutions from my home country represented so strongly at the AASHE Conference. Since Gotham 360 works closely with schools on both sides of the border, it was beneficial to spend time sharing ideas and listening to the concerns of sustainability experts from all over North America. Although Canada has different energy regulatory schema, and a far different political environment than the United States, your northern neighbors face similar challenges around sustainability and other environmental issues. By embracing these differences and building on areas of commonality, higher education institutions from both countries can help achieve the goals detailed in the UN's 2030 Agenda for Sustainable Development. The Gotham 360 team left Pittsburgh inspired and empowered by the enthusiasm and collective energy that permeated throughout the AASHE Conference. The roadmap to global peace and prosperity, as described in the UN Sustainability Development Goals, provides us with a blueprint for success: A path forward, toward true Perpetual Sustainability. We are already looking forward to next year's gathering, to witness firsthand the progress the higher education community has been able to manifest, together.